The Environmental Movement has been around since the days of naturalist John Muir (late 19th century) who is the founder of the Sierra Club. Back then it had high credibility and did great work to promote and preserve our natural beauty such as national parks, lakes and rivers. Sometime in the 1950’s it started straying into scare tactics. A popular claim was Global Cooling – we were going to freeze to death via our polluting ways. Then it turned to the opposite claim of global warming after a few warm years. President Nixon used this cause to divert our attention from the Civil Rights Movement and the anti-war furor over Vietnam. He proclaimed Earth Day as an annual event and enlarged the Environmental Bureau into a separate agency, the Environment Protection Agency, EPA. This worked and today the EPA has become one of the most meddling entities in the federal government. It is a friend of the environmentalists and is often used as a weapon for their advocacy. Under the Clinton Administration the environmentalists started an outrageous claim. They accused corporate America of seeking Black communities to dump their waste, poison the water and render the land toxic. They summed it up by calling the mythical activity “Environmental Racism” and persuaded (funded) local civil rights groups to join in the fight and demand “Environmental Justice”. This died down after about ten years. One of the current activities of the environmentalists is the assault on coal. They want to kill the coal industry. New York City Mayor Michael Bloomberg donated $50 million to the Sierra Club for the sole purpose of killing off our coal industry. Right now they have the EPA planning to shut down over 31 coal fired utility plants by way of a “Rule”. Rules are like executive orders whereby it avoids congressional approval. With the blessing of the President they just do it as if it were voted legislation. This will wreck our economy and destroy our personal worth if we don’t fight back and stop the action. Think of the many thousands of jobs that will be lost and the rising cost of electricity we will all be stuck with. Another tactic by the environmentalists is a legal proceeding known as “Sue and Settle”. This is done by collusion between the environmentalists and pro-environmentalist bureaucrats. These groups will file a massive lawsuit against the EPA, Department of Interior, Bureau of Land Management, Fish and Wildlife Services, etc. The problem is the “deal” has already been made. Thus, the agency being sued will quickly sit down and settle with the environmentalists. In the end, it is like a wish list for the suing environmentalists as the federal agency gives them just about everything they want. According to Marita Noon, Executive Director, Energy Makes America Great Inc., “In 2011, the Fish and Wildlife Service (FWS) entered into a massive settlement of a lawsuit filed by environmental groups in which the agency promised to address more than 250 candidate species it had previously found warranted protection but were precluded from listing due to a backlog. As a part of the behind-closed-door agreement, the FWS also pledged to review hundreds more species proposed for listing.” According to Senator David Vitter (R-LA), “It is the sue-and-settle agreements. This future regulation could prohibit many beneficial uses of tens of millions of acres of private property. All this was set in motion while no affected landowner or other stakeholder was given any opportunity for input”. You can’t “break ground” on land that houses a registered endangered species – factual or not. Just like that millions of acres will be denied any development or growth. Economic opportunities and millions of jobs will be put on “ice” so that the environmentalists can have their way. This sue-and-settle racket is growing in use and we and Congress must stop this mockery. In effect, it is a conspiracy to behave in such a matter within the court of law. Chicago has become the “Poster Child” for criminal violence. Your city is often in the news because of the never ending homicides. Most of the victims are youths or young adults. Many are crying out for an end to this carnage but no one seems to know the answer. We think the answer is obvious. Bruce Weinberg, Professor at Ohio State University, states: “Public officials can put more cops on the beat, pass tougher sentencing laws, and take other steps to reduce crime, but there are limits to how much these can do…We found that a bad labor market has a profound impact on the crime rate.” The explanation of the violence happening in your crime zones is further explained in The Review of Economics and Statistics: “As wages go down and unemployment goes up, crime goes up – driving businesses and residents out of the community. This in turn causes more unemployment, which causes more crime – a ‘spiral dive’ situation from which it is difficult to recover.” That is what Chicago needs – jobs! There is a way to address this need in neighborhoods with higher poverty rates. Simply implement Section 3 of the HUD Act (24CFR Part 135). Section 3 states that 30% of all new jobs from HUD funding are to go to people living in public housing or under the poverty level. Businesses that hire these Section 3 residents can be self-certified as Section 3 firms. Section 3 firms are allocated a 10% set aside for all contracts derived from HUD funding. If the Chicago Housing Authority alone would be compliant with this required law it would have let over $120 million in Section 3 contracts and created thousands of new Section 3 jobs during the past three years. This fact was found during a three year audit of CHA by HUD authorities. This audit came after some of our members filed a complaint against CHA. CHA is now entering into a Voluntary Compliance Agreement (VCA) with HUD. So, the timing is brilliant if your office ensures that CHA will start doing the right thing and begin hiring its residents and create and utilize Section 3 firms. Over the years, many agencies and divisions under the control of your office have received billions of dollars from HUD. However, none of these entities comply with Section 3 of the HUD Act. We know that from a Freedom of Information Act request via HUD. Think of how many jobs can be created and many people rising up from poverty thanks to the due diligence of their mayor. Mr. Mayor, you can do this. Demand compliance from your people and HUD will even come in and train them. Implement this program and watch the crime decrease on a monthly basis. There will be very little “job shifting”. The majority of Section 3 workers will be taking jobs that are probably performed by people living outside the Chicago city limits. We did a review of the last Midway Airport expansion. Of course, there was a Project Labor Agreement on this expansion. The vast majority of the home zip codes of the workers were outside of Chicago. Many were outside of the Chicago Metropolitan Area and a noticeable number were out of state. Besides that, the Section 3 program is the LAW! One sweet day, Chicago will start complying and we pray that now will be that time. We trust in your leadership and wisdom. Sir, if you do make this bold move and make Chicago the model city for Section 3 compliance, small business creation and a flourishing labor market, the National Black Chamber of Commerce will applaud this effort. We have 24 chapters within the state of Illinois. Our state chapter, the Illinois Black Chamber of Commerce, Larry Ivory – President/CEO, is ready to assist in the implementation of Section 3. We will give our chapters in the Chicago area technical assistance in showing public housing facilities how to organize and move as one progressive and organized network. HUD will provide assistance but is limited in its budget (for manpower). We are nonprofit with a mission to assist in projects like this. The NBCC is the largest Black business association in the world and we have been advocating the compliance of Section 3 since our beginning in 1993. Please do not hesitate in having your people contact our office. Here’s to a better Chicago. 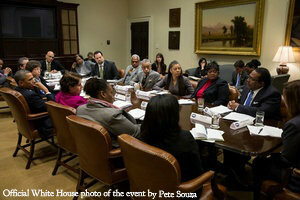 The President met with African American leaders yesterday in the Roosevelt Room at the White House to continue their dialogue on his plan to strengthen the economy for the middle class and continue to build ladders of opportunity for those striving to get there. The President reiterated his commitment to supporting policies that will directly impact those hardest hit by the economic crisis by making sure that America is a magnet for jobs, increasing access to job training programs, partnering with high-poverty communities to help them rebuild, and encouraging companies to invest in disadvantaged neighborhoods. The President also reiterated his call to reform education by expanding universal pre-K for every child as a way to significantly decrease the achievement gap. The President and the leaders expressed a shared concern about the need to implement common-sense improvements to the voting process because our democracy works best when every American eligible to vote has the opportunity to cast their ballot and make their voices heard. The President called on the leaders to continue the national dialogue on the need for a balanced approach to deficit reduction. He stressed the harm that the automatic cuts known as the sequester will have on thousands of jobs while cutting services to children, seniors, mental wellness programs, small businesses, and those in our military. The President praised the participants for their steadfast leadership on a broad range of issues critical to improving the economy and strengthening our country. The leaders in attendance also highlighted their goals to continue to build momentum for Congress to act in the best interests of the American people by supporting policies that help move our country forward. And yes - save the whales! Global Warming, Toxics, Campaigns, Grassroots Organizing, Student Organizing, Activist Recruitment, Actions, Strategy, Media, Online Organizing, Human Resources, Membership, Finance, Legal, and more! Visit our website for a full list and details on the specific tasks and requirements for each internship. Positions are available in Washington, DC, San Francisco, Austin, Boston, Charlotte, Chicago, Cincinnati, Denver, LA, New York City, Philadelphia, and Portland, OR. Not all internship positions are available in each location. Visit our website to find out the locations of the various positions. Our Summer internships start June 3rd and end August 9th. Part time and full time positions available. Most positions require a commitment of at least 3 days/week. Each intern is trained and closely supervised by a member of the department to which they've been assigned. We are flexible with your schedule and can help you receive course credit. All internships are unpaid. Unfortunately Greenpeace cannot provide housing. Applicants must be over 18, but do not have to be current students. We’re looking for people with excellent verbal and written communications skills, strong online research skills, the ability to work well independently, commitment to non-violence as a means of affecting change and enthusiasm for protecting the environment. Visit http://www.greenpeace.org/internships for the qualifications required for each of the various positions. Diverse perspectives and experience enhance the way Greenpeace selects and approaches issues, as well as the creativity and effectiveness of our campaigns. Greenpeace strongly encourages applications from women, people of color, and other underrepresented communities. On the same weekend that thousands gathered on The National Mall to protest construction of the Keystone XL pipeline, President Obama was golfing at the Floridian Yacht and Golf Club with electricity, oil, natural gas and pipeline players Jim Crane and Milton Carroll. Crane owns the club, which is located on the Treasure Coast in Palm City, Florida. AAEA has partnered with a Houston-based pipeline company, S.L. Sibert Management and Construction Company, and is looking for business. Crane is chairman and chief executive of Crane Capital Group and he is also the owner and chairman of the Major League Baseball team Houston Astros. Private equity firm Crane Capital, based in Houston, bought Champion Energy Services from Lehman Brothers in July 2008 for an undisclosed sum. Crane Capital chief Jim Crane, the majority shareholder in Champion, then merged the company with Ambridge, a small wholesale electric company he founded. Currently, Champion serves the equivalent of 350,000 residential customers, with a peak load of 1,000 megawatts. 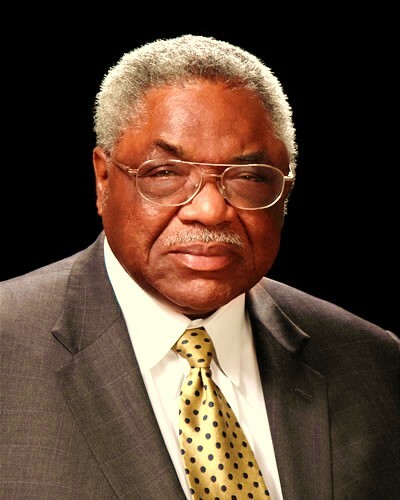 Carroll is the chairman of CenterPoint Energy, a public utility company based in Houston, Texas. CenterPoint Energy is composed of an electric transmission and distribution utility serving the Houston metropolitan area, local natural gas distribution businesses in six states, a competitive natural gas sales and service business serving customers in the eastern half of the U.S., interstate pipeline operations with two natural gas pipelines in the mid-continent region, and a field services business with natural gas gathering operations, also in the mid-continent region. Member of the Board of Eagle Global Logistics, Inc. 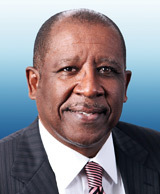 Member of the Board of Ocean Energy, Inc.
Baltimore Gas and Electric Company (BGE)’s new senior vice president for regulatory and external affairs is Calvin G. Butler Jr. effective March 1, the energy firm announced. In his new role, Butler will oversee the areas of regulatory, governmental and legislative affairs, communications and corporate relations for the central Maryland company. Butler previously served as senior vice president of corporate affairs for Exelon and played a lead role in helping to bring to fruition the merger between Exelon and Constellation Energy. 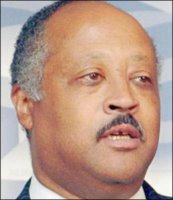 Prior to that, he held the position of senior vice president of human resources for Exelon. AAEA is partnering with the S.L. Sibert Management and Construction Company (SLSMC) to pursue pipeline construction contracts and pipeline ownership opportunities. This is a particularly important time for this partnership because natural gas will be the dominant fuel source for new electricity power plants. Liquefied natural gas exports will also be expanding significantly due to the increased utilization of hydraulic fracturing (fracking). The Center and SLSMC intend to aggressively participate in this natural gas renaissance. SLSMC founder and president Sam Sibert notes that, "thousands of miles of pipelines will be developed in the coming decade." AAEA founder and president Norris McDonald says, "these pipelines will be on public and private lands. We are seeking partners who can help facilitate our participation in this exciting new energy developement." Please contact us if you are interested in such a partnership. The SLSMC, formed in 1993, is a top pipeline construction company in the gas and electric industry. SLSMC is currently a primary contractor for the Texas Utilities and Electric Company (TXU). In 1996 S. L. Sibert became a prime contractor for TXU installing electrical services to the Dallas-Fort Worth Metroplex. Sibert widen the field in 1999 by including gas services to its rapidly expanding range of capabilities when they signed an Alliance Contract with TXU-Gas. Under the Alliance Contract Sibert installs new gas services in the Western Regions of Dallas and Fort Worth. In 2001 Sibert was able to showcase its advanced techniques in Directional Boring by completing a highly profiled water-line replacement job for Colleyville, Texas using a specific Boring method. The Colleyville water-line replacement was the first job of its kind completed in the Dallas-Fort Worth area. Sam L. Sibert is a graduate of the University of Texas at Arlington. Sibert played for Kentucky State University where he helped lead his team to two NAIA national championships. Sibert also played in the National Basketball Association for Kansas City-Omaha King. He is founder and CEO of S.L. Sibert Company and he built one of the largest construction companies in north central Texas with employees operating in several states including Oklahoma. Are you a working journalist ready to explore issues affecting your community? Are you a non-working journalist looking for a new opportunity? Are you a media professional interested in finding out how your field connects with an increasingly important business? If so, the National Association of Black Journalists (NABJ) invites you to join us in Houston, TX, February 21-22, 2013, for their Media Institute on Energy. Energy experts and journalists from across the country will gather at this inaugural conference to share knowledge ranging from the impact of energy practices on various communities to the growth in alternative energy. Did you know that business reporters who cover energy acquire specialized expertise that leads to higher salaries? Join them in Houston for empowering sessions to help you learn more about oil, gas, wind, solar and other alternative fuels and craft a career as a media professional in the energy sector. Our program will include a tour of facilities in Houston's Energy Corridor. Don't miss this opportunity to expand your career options! Click HERE to view the Preliminary Schedule. I participated in an American Association of Blacks in Energy (AABE) Summit this week and, as usual, they put on a very successful event at the Navy Memorial in Washington, DC. All of the major energy associations were represented by their presidents and CEOs. Congress was also well represented by Congressman James Clyburn (D-SC), Congressman G.K. Butterfield (D-NC) and Senator Robert Menendez (D-NJ). Bob Perciasepe represented the U.S. EPA. Donna Brazile gave a rousing presentation and engaged in banter with me. Although many participants asked about partnership and ownership opportunities, the presentations were about employment opportunities in the various energy industries. The industry associations do not appear to be interested in facilitating partnerships and ownership opportunities with African American entrepreneurs. Observers of our inquiries should not conclude that we are simply whining about a very bad situation. They should conclude that our inquiries represent a determination to gain energy infrastructure and resources ownership by any legal means necessary. Pressure is increasing in this area because many of the extremely qualified professionals who are members of AABE are retiring and becoming entrepreneurs and want to own energy businesses. However, constraints to entry are obvious and include significant capital outlays. It appears, however, that the energy industry associations and their member companies will not be rushing to assist African Americans in becoming owners of energy infrastructure and resources. They are excellent at sponsoring luncheons, dinners, summits and conferences though. What are we to do? I have come to the conclusion that we will have to play hard ball. Leverage all of our talent and resources in order to break into an industry that appears unwilling to assist us. This will include utilizing any and all political power at our disposal. It will also mean pursuing a more aggressive private sector approach among ourselves. This dynamic campaign should also include rewarding our friends and calling out those who are indifferent or hostile to our aspirations. Let's start cooking with natural gas, coal, wind, solar, nuclear, wood chips, and hydro.